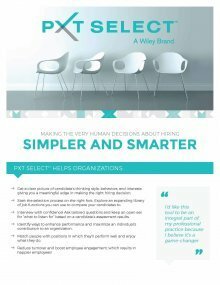 The PXT SelectTM assessment measures how well an individual fits specific jobs in your organization. The “job matching” feature of the PXT Select is unique, and enables you to evaluate an individual relative to the qualities required to successfully perform in a specific job. It is used throughout the employee life cycle for selection, onboarding, performance, effective management, and strategic workforce planning. Profiles Sales CheckPoint™ helps you precisely target developmental needs, enable more effective coaching and communication, align sales priorities, and improve productivity and retention. Pathway Planner™ is an in-depth planning and personal assessment you can use as an educational and career planning tool to discover which career possibilities best suit you. The ProfileXT® (PXT) assessment measures how well an individual fits specific jobs in your organization. The “job matching” feature of the PXT is unique, and enables you to evaluate an individual relative to the qualities required to successfully perform in a specific job. Our Step One Survey II® (SOSII) is a brief pre-hire assessment that measures an individual’s basic work-related values. It is used primarily as a screening tool early in the candidate selection process and provides valid insight into an applicant’s work ethic. The Customer Service Profile™ (CSP) measures how well a person fits specific customer service jobs in your organization. It is used primarily for selecting, onboarding, and managing customer service employees. The Profiles Performance Indicator™ is a DISC-type assessment that reveals aspects of an individual’s personality that could impact their fit with their manager, coworkers, and team as well as their job performance.